Planted New Zealand Flax (Phormium tenax ‘Rubrum’ in curbside median. Planted Japanese Maple received from Maria, our old post person. Planted Japanese black pine “Thunderhead” replacing dead Japanese black pine. 2/16/17, Thur: Planted Azalea nuccios “Purple Dragon” at end of azalea row. 4/27/16, Wed: Planted new rosemary bush. 12/7/15, Mon: Sakura dressed in gold. 12/16/15, Wed: Lightly pruned kuro matsu. 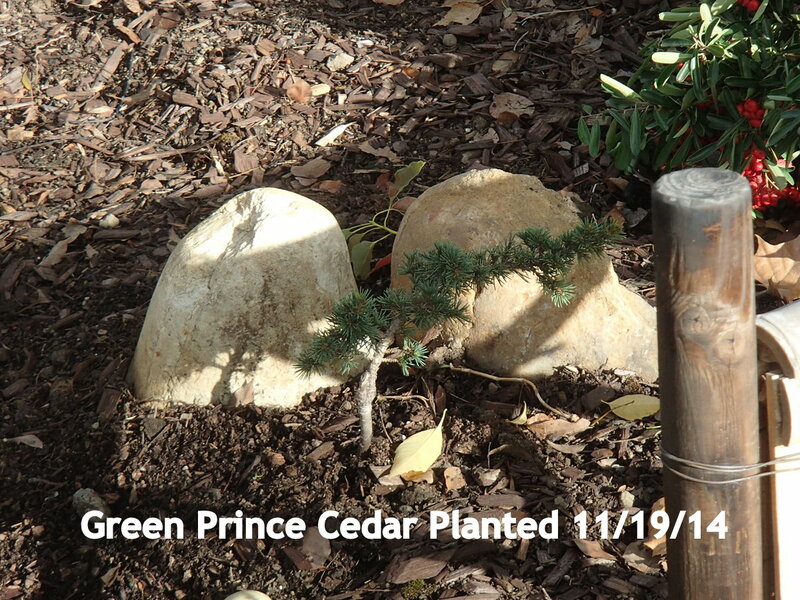 Planted Green Prince Cedar in north west corner of front garden. Planted Impera c rubra “Red Baron” Japanese Blood Grass along walkway, replacing most of the blue fescue that was no longer very attractive. Planted Sedum anglicum Gray ground cover along rock wall. 10:30 – 16:30 Mel finished cobble walls. Planted Pyrocantha Santa Cruz in north west corner of garden replacing a spindly Azalea which was moved near the black pine near the entry to see if it will do better there. Planted Dymondia ground cover in north western part of garden. Planted Pink Princess Escallonious, two Dwarf Yedda Hawthorne, Lampranthus Spectabilis Pink, Sedum Spurium Dragon Blood. Treated azaleas and new plants with Super Thrive. 10:00 Jack Christiansen came to visit the garden. He identified several trees in the front garden. The large cedar is a Hollywood Cedar. The small juniper spreading over the dry stream is a San Jose Juniper. He recommends Shinpaku Juniper for their attractive foliage.